There, that’s better, if you’re into that sort of thing. 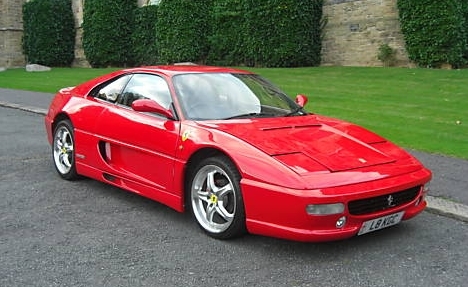 Certainly infinitely more reliable than a Fiero-based F355 kit car anyway. 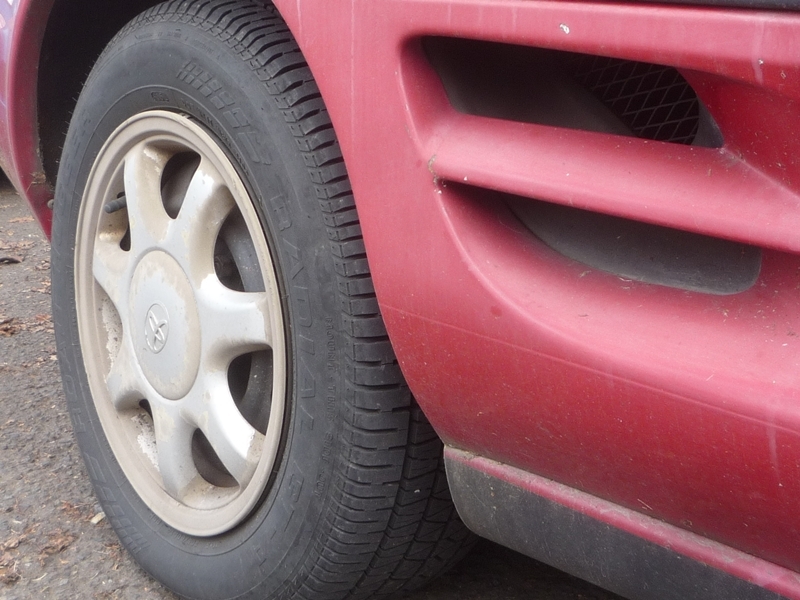 Now that we’ve had our fun with the MR2, maybe we can say something positive about it? Undoubtedly, it had a hell of an act to follow. The original Mister 2 was one of the more brilliant cars thrown our way in the last…well, lifetime, for some of you younger readers. It took the world by storm, much like the Miata did, except Toyota didn’t stick with the formula: light, tight, a switch-blade carving knife, and yet utterly reliable. (Tom’s CC on it is here). So why wait and do the gen2 first? It’s because I never really spent much time thinking about the gen 2 MR2; its predecessor totally crowds it out of the memory banks with the file name MR2. But then seeing the steel wheels on this one grabbed me, and hard. Better write it up quick before its files are purged again. I know that wont happen with the gen1 files; they’re etched in deep. This car perfectly reinforces the Toyota stereotype as a split-personality company known for the most boring reliable transportation appliances as well as some of the more exciting and brilliant sports cars ever. And stumbling on this MR2 with its little steel wheels just crystallized that, with both qualities represented so equally in one vehicle, no less. Which is not necessarily a good thing. 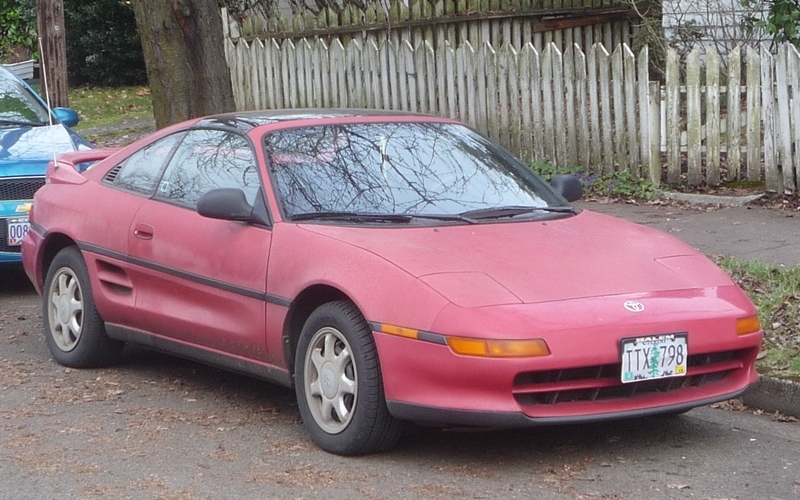 Yes, the original MR2 was just as reliable and long-lived as its Corolla donor. But its forceful, edgy and fun-loving character always shone through, and still does after a quarter century. This gen2 MR2 doesn’t. That’s not to say it wasn’t a capable and decently handling car, and even plenty brisk in its 200hp turbo version. And it was/could be modded and prodded into acts of genuine athleticism. But that’s not what it spoke to me when I found it sitting there. It said: someone fell for my Ferrari lines while I was sitting there at the Toyota dealer in 1991, and has enjoyed its Camry-level reliability as a daily driver for twenty years now. Maybe it’s not in the original owner’s hands anymore, but then I wouldn’t be surprised if it still is. 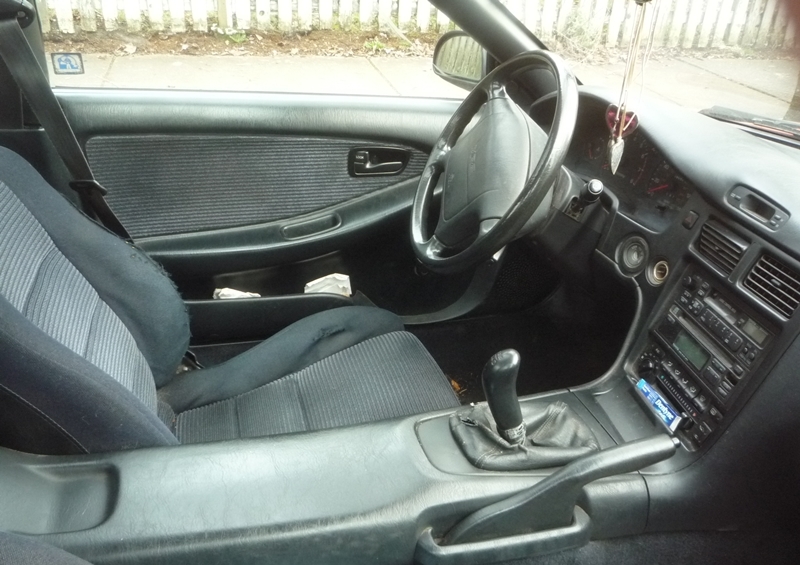 That interior is as old-school Camry-esque as any I’ve ever seen, dripping with the “fat content” padded surfaces of that particular Toyota era, quite unlike its predecessor’s personality-appropriate hard-edged and angular interior. Perfect for that long commute on the freeway before they finally got sick of it and moved to Eugene; that sun-faded paint says California all over it. And now it will most likely spend the next twenty years aging gracefully here (update: it’s still on the same block, three years later). The 1st gen MR2 was actually one of the first vehicles I ever sold on Ebay. I had bought if for the princely sum of $225 back in 2002. A 1989 model in red with 116k original miles. One fuel pump and a couple of tires later, and I had the perfect daily driver for one (and stuff). I later sold that car for $2700 to an enthusiast who drove all the way down from Michigan’s Upper Peninsula. He had planned to help his sister move back from South Georgia and my location just happened to delve in perfectly with his plans. A very nice fellow with PTSD. After he hauled the vehicle back, he had a panic attack and ended up customizing the passenger side while inside his garage. I’ve never owned a 2nd Gen Mr.2 but have found plenty of Gen 1’s at the auctions. Most folks sell them right before major maintenance needs to be done. Until about 2003 you could get one in reasonable shape for around $500 to $1000. But nowadays the Gen 1 will go for close to $1500 wholesale. Gen 2’s are even more variant, and I’ve seen them go as high as $4500 with very low miles. I was going to save it for the gen1 MR2 CC, but I’m inserting a pic of a ’87 I saw come in on a lot, and go again in just a few days. One owner; 260k miles. Price: $3950. Impressive! 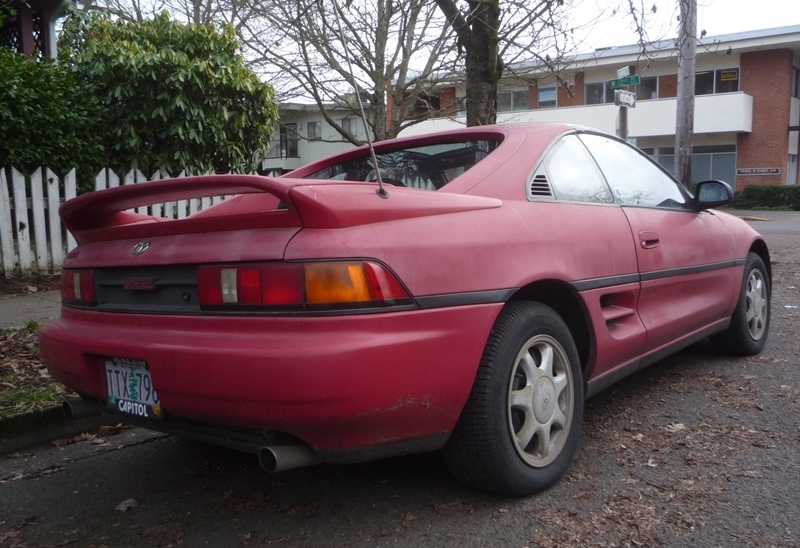 There’s a gen 1 MR2 sitting on a local lot down the street from me right now with a $1695 price tag on it. I haven’t looked too closely at it, but I know it’s got almost 300k miles on it. It’s been sitting there for a while, so I suspect there’s other issues as well. Glad to see you back, Paul. TTAC just isn’t the same without CC. 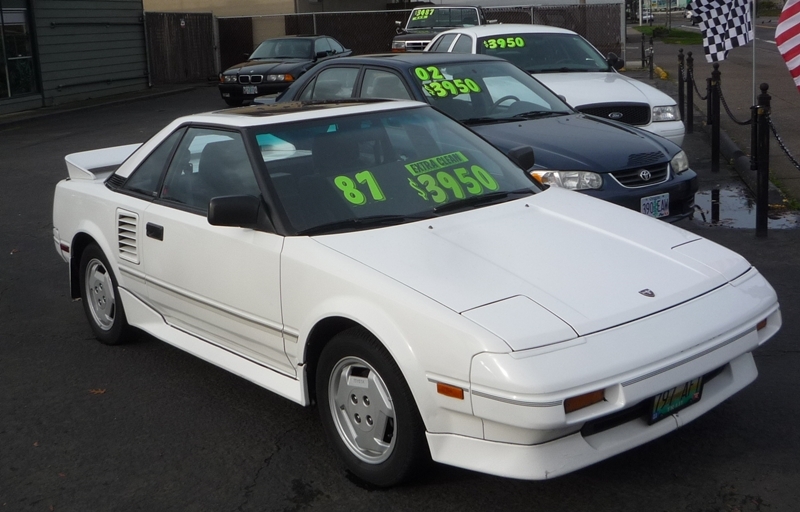 I’ve never much cared for either generation of MR2, but I gotta say that white ’87 is an extremely enticing car! I wouldn’t be so fast on calling this a 1-owner car, especially if it looks like it spent part of its life in California. Though early 90s paint is not great, so who knows? How old is the license plate frame? I don’t know how long Capitol has been using that format, or, actually, how long they’ve owned the Toyota dealership in Salem. Oddly enough, the Capitol Market convenience store in Salem has this same “Capitol” logo painted on an interior wall. They also have all sorts of funky old signs designating areas for meat, dairy, etc… even though most of what that place sells now is beer. Matt: I do take liberties with some of my assumptions. My imagination gets carried away; it could be a fourth owner car for all I know. Let’s just say whoever has owned it has kept it for its basic transportation value, because of it still having those steel wheels. Any enthusiast would have picked up a set of used alloys at the junkyard, at the very least. That’s what led me to that assumption, right or wrong. I like the new site and have been reading your pieces on TTAC for going on a year now. I’m glad to see you still writing! Capitol has had that logo for about the last 20 years. As for how long they have been selling them? Before that car was made, pretty sure. But I think you are right in that it is probably not a one owner rig. Mid engine cars, a rather strange little branch on the automotive family tree. I honestly was amazed how well the Fiero that was used in “Top Gear USA” held up to all the abuse thrown at it. Other than GM and Toyota I wonder how many “mainstream” (as opposed to exotic car) manufacturers have tried that layout. Speaking of tough Fieros, did you see the episode of Mythbusters where they literally skipped a Fiero across a pond? I mean, they drove off a ramp, splash, splash, and away they went, skipped a Fiero a pond. Truly impressive. Fiat X1/9 springs to mind. Don’t worry too much about being uninspired by the gen 2, Paul, even Toyota was uninspired by it. I picked up some Toyota dealer videos at the transfer station a few years back and all they talked about was the fuel efficiency and the fit and finish. It may as well have been a mid engined Corolla. My girlfriend has one of these. A relative of her’s bought it as his fun car after he retired and put about 90K on it in 13 years. Once he got to old to climb in and out of a car that low he gave it to her. Aside from so bat paint crazing on the plasitc bumpers it is like new. It is the non-turbo automatic model sadly, but is still really fun to drive. It feels much more like a grand tourer than the original with a surprising trunk and comfortable interior. I like driving it, but find it *almost* boring, only because it is nearly impossible to find its limits on regular streets. You have to push it quite hard to feel like you’re workign the suspension & chassis. I was selling Toyotas back in the early 1990’s at a dealership outside of Atlanta. The real money were the new pickup trucks (and used cars), and maybe Camrys. The rest of the line, not so much. However, I was the only real ‘motorhead’ on the sales staff, I quickly developed a reputation among the rest of them so they sent me every freakin’ Mario Andretti wannabe that wanted to test drive the faster cars. Let’s just say it was their way of hazing me. Most of the folks I was dealing with were fairly young people, most of the time they could get the credit to buy, but not the insurance. They usually ended up in some variant of the Celica, which was good for me. Or the middle-aged guy who wanted a Ferrari look-alike, but couldn’t wedge his fat *ss into the MR2. Those were a hard sell, because the Supra was a fair amount more than many of these divorcees wanted to pony up, and for some of them, the Celica wasn’t extreme enough. Even in the Turbo versions. Of course, our Chevy store could sell them a RS Camaro that would get the young chicks to notice them, but I’d lose the sale because I didn’t work there. Still, I managed to sell enough of them that it wasn’t a bad living for me. But at the time, I was still a newlywed, with an infant daughter, long work hours (72+ hours a week!) and a long commute from Atlanta to Newnan. I eventually got another job in printing & packaging and left the car business for the second time. The color caught my eye immediately – almost that same sickening, oxidized color you shot that vaguely obscene CC clue of the Suzuki car a few months ago! Speaking of mid-engined cars, a co-worker years ago had a 1st gen Fiero and loved it – it didn’t burn up, either. I see these MR2’s around town every once in a while, but I’m not really familiar with them – definitely a niche car – normally I would be more interested, but I’m not a Toyota fan at all. I respect them, I just don’t like them. I also remember ‘way back when where the rumors of a mid-engined Corvette was in the works, but that was too many years ago, and, of course, never happened. Only about .004% of Fieros ever caught fire, but people harp on and on and on about Fieros catching fire. The actual figure is 75% higher. Next Toyota to do a CC on: 69-72 Corona MARK 2! So how did you know I just finally found one a couple of days ago? I’ve had my eyes out for one since starting CC two years ago, and had almost given up. I can’t promise you it will be right away, but pretty soon…. My favorite MR2 I’ve spotted had the Ohio licence “RU MRS2”. I grew up with the gen-1 MR2, gearheads liked them but no one else. When the gen-2 came out, wow, then everyone wanted one! Sure the BASE model had the steelies and you could get an automatic, but the real joy of that car was the Turbo model with a stick. It had alloy rims, and no problem exploring the limits. I am not sure where all the hate for them comes from, they were still very light but they had a much nicer interior, they looked spectacular and they had so much more tuning potential. Gen-1 cars, if you can find one that hasnt rusted away or been neglected to death, sell fast, but for not much money. Gen-2 cars in nice shape command very high prices, I have seen unmodded low mileage non-turbo survivors selling for $7-8k, even more for the real garage queen turbos, not that there are many left. Even beaters go for $3k+. I have a gen-3 Spyder, its very fun, more like the gen-1 car, and more like a Miata. But I would gladly trade it for a gen-2 turbo in equivilent condition! The base 1st gens had steelies too, they had the base Corolla FX-16 wheels, though you never ever saw them. I was only 8 years old in 1991, but I remember REALLY lusting after the Gen2 MR2 in high school. Back then I thought the Gen1 was extremely goofy looking. It wasn’t until gaining more automotive knowledge (through experience and literature review) that I became more taken with the original. I suspect a fair amount of people had similar experiences. While I’d prefer the supercharged original, I wouldn’t frown on a well maintained turbo Gen2. I don’t mind the steelies, but the wheel covers are objectionable. Slightly larger black steelies with dog dish caps work wonders on any car though, IMO. 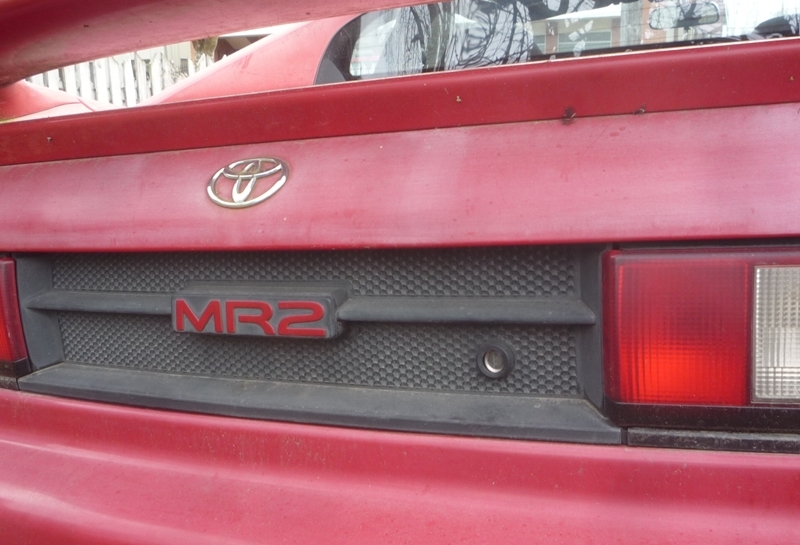 These second generation MR2s where never big sellers in Canada – over inflated prices really hurt them. There are a few turbo imports from Japan that have come in lately. I drove a 20 valve powered 1st generation MR2 in white that was brilliant fun. I had a ’91 5spd t-tops, not a turbo. It was fun, quick, and prettty reliable–and what did break was cheap to fix. Loud on the highway with the engine at your back. Got broken into a couple of times, which caused the t-tops to leak. Sold it in ’99 when I got married. Seemed like the thing to do at the time. Funny you should choose today for this car. This past week I’ve seen the same red 2nd gen MR2 about three times in a strip mall parking lot I pass on my way out to the highway. I had several Hot Wheels versions of this car as a kid, so despite rarely seeing them on the road, I always knew about it. Guess you can call me a fan. CC effect going 5×5 Paul I drove past this exact car today MR2s are quite popular both the early and late models and but for the plates this is on Napier hill, I thought of buying one, sanity prevailed I didnt. Wait, I lie, I passed a 3rd gen on the highway yesturday on the way home. All of the 1st and 2nd gen MR twos have returned to the earth in the northeast. Kind of a shame because they look like cool little cars. Like most everyone else, I had forgotten about these. I had also forgotten what I used to hate about older red cars. Even now (after a genuine PN CC treatment) these fail to call my name. Maybe if I drove one . . . . . Damn that suckers faded, I have tought time picturing that car ever being bright red. Someone didn’t Nu-Finish(the once a year car polish!). I would eventually like to add something mid engined to my stable,I’d have a tought time choosing between a 914, X1/9, Fiero or 1st gen MR2, I find them all equally compelling for their own individual reasons. Go for it! I loved the 2nd Gen Fiero, the 914, and the 2nd and 3rd Gen MR2’s because they were the REAL reason that Pontiac, Porsche (with a little VW help!) 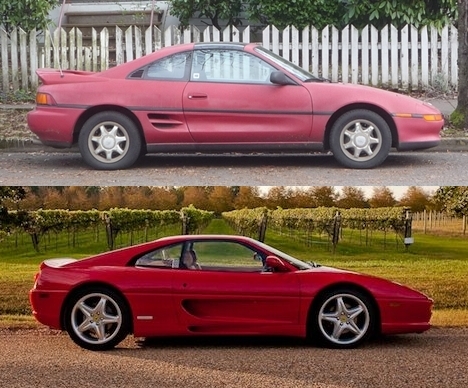 and Toyota had customers in the first place… I’ve a 2nd Gen Fiero GT, and I’m STILL looking for a Robin’s Egg Blue (in Canada only) 2nd Gen MR2, and I’ve got a White MR2 Spyder waiting for me in Seattle, they’re THAT good. I always kind of figured that the 2nd gen Mister Two was an attempt to ape the success of the Lotus Elan-inspired Miata. 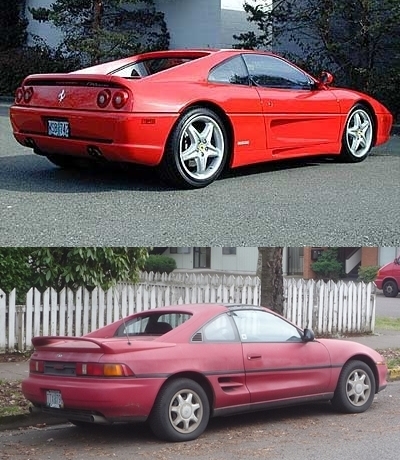 In essence, Toyota’s execs must have thought that if Mazda’s copy of a cool British roadster could be such a huge hit, they would have an even bigger hit if they copied a much more expensive Italian Ferrari. They should have called the 1st gen the SLGC instead of MR2, street legal go cart. That’s a good description of them. My Brother had a white turbo 2 gen MR2. I was a fun little car. Like someone else said I’m not sure where the dislike for these cars comes from. I never drove a non-turbo so maybe they were real dogs I guess. But the turbo, if you were a young guy…..was a lot of fun. My DD is a 1990 Celica Alltrac, which I think basically has the same engine. It’s a fun car too. I’ve been reading a bunch of the older entries around here and I have to say I don’t get why certain cars get bashed around here. Like 3rd gen Camaros. I had an 86 that i bought in 92 which I drove for 2-3 years, then my dad and brother drove it for a couple, then they sold it to a friend and he drove it for a couple of more years. It never gave me any trouble at all. You still see a ton of 3rd gen Camaros daily driven. They might not be the greatest cars ever but they were good cars for their time. And most of them were beat to death. It think they were much better looking than same era Mustang GTs with all that ridiculous plastic cladding. There is a car on a used car lot a hour from me that is a near twin to this red 2nd gen. Unfortunately, that one has the automatic transmission, which is a huge shame and probably why it’s only got 134K miles on the odometer. And yes, it still has the factory “steelies” and very faded red paint.